REAL Results from the Law of Attraction! The 'Law of Attraction Pro' is the ULTIMATE course on manifestation. It distils the knowledge of the world's greatest LOA teachers, to bring you ONE SINGLE COURSE that teaches EVERYTHING about the Law of Attraction. Especially how to get the most powerful results - QUICKLY. The Law of Attraction Pro course is a simple audio course - with an accompanying, downloadable workbook - that unveils EVERYTHING. It uncovers the history behind the Law of Attraction, profiles some of its biggest names and most powerful success stories, and uncovers the most potent techniques for manifesting in your life. Don't expect your common, run-of-the-mill, "think-visualize-act" course. I'm talking about a serious, highly practical guide to the Law of Attraction - and the little-known methods for activating its power, starting TODAY. This is a high-quality "meta-course" - the likes of which the self-development field has NEVER seen before. If you want to experience the Law of Attraction, this course WILL show you how. Even if you've had absolutely NO success with the L.O.A. before. This is the REAL DEAL. Imagine combining the teachings of the greatest, practical Law of Attraction teachers -- then removing the HYPE, BULL and FAKE GURUS. Imagine combining the TRUE SECRETS of these authorities -- including my own 15 years of LIVING the Law of Attraction -- and you're coming close to what this course offers you. 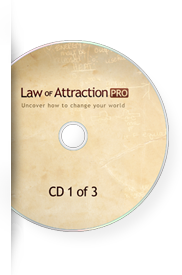 Rest assured, this is the ONLY Law of Attraction course you will EVER NEED. Want to explore this a little more? The 6-Point Attraction Formula - And Much More. 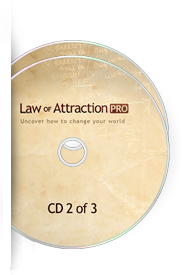 Want to learn more about the Law of Attraction Pro course? Law of Attraction Pro - Volume 1 - "An Overview of Manifesting"
The Essentials Behind the Law of Attraction -- and the “fundamental truth” that underpins the entire philosophy! What you MUST do if you want to enjoy a more positive, confident and fulfilling life! The 4-point program ANYONE can follow – making it possible to achieve ANYTHING you ever wanted! Why the Law of Attraction is much more than just Positive Thinking – and what you need to know to benefit from this knowledge! Where the Law of Attraction comes from – and how to ensure you know what it's capable of helping you achieve! The difference between your “personal” and “impersonal” mind - and why this is critical to your success and happiness! The simple 3-step process to harness the unlimited power of your mind -- to transform every area of your life for the better! Why 'making faces' at people is important – and what it can teach you about using the Law of Attraction! How the Law of Attraction REALLY works – what it is, and what it definitely IS NOT! The ONE THING that can keep the Law of Attraction from working – and keep you from reaching your full potential! The THREE THINGS that EVERYBODY wants – and how your own thoughts can help you attract more of them! The difference between “constructive” and “destructive” thinking – and how to ENSURE you're using the right type! Real-life success stories that prove the Law of Attraction Pro works – and how ordinary people have made their dreams come true! Law of Attraction Pro - Volume 2 - "Manifesting Techniques"
Law of Attraction Pro - Volume 3 - "The Manifesting Mindset"
As we shift beyond the basics of the Law of Attraction, you'll be guided through EVERY ASPECT of the MOST POWERFUL methods of manifesting in your life - all while you just sit back and relax! You'll receive the LATEST, and most REFINED techniques for activating your 'manifestation magnetism' - all within MINUTES of listening to the program. The 3 ESSENTIAL elements you need to remember – or your attempts at attracting are doomed to fail! The Know-See-Get Technique – how knowing what you want, seeing what you want and focusing on what you want will ultimately bring you... WHAT YOU WANT! The 4-Point Success Generator -- to help ANYONE enjoy greater success in their business or personal lives! The “Movie Screen” Technique -- the most powerful visualization exercise ever, guaranteed to help you focus on your goals! The 3-Step Manifesting Ritual – to help you understand what it is you REALLY want! The Energizer Method – a simple but effective technique for turning your thoughts around and helping you attract everything you've ever wanted! The 4-Point Positive Energy Booster – to help you focus your energies precisely on the things you want... and not on the things you DON'T want! How to tune into your thoughts in 3 simple steps -- to get the things you want faster and more efficiently than ever! The all-natural method you can use to come up with hundreds of ideas -- for new products, books, or designs for buildings, gardens, furniture, clothing... even while you're ASLEEP! How to truly “get what you give” -- and reap the rewards for the rest of your life! How to change your luck for the better – without relying on magic spells, rabbits' feet or lucky charms! One of Napoleon Hill's secret weapons! The easy-to-follow, 3-stage ‘D' TECHNIQUE – to help you identify your goal, stay focused on it, and make sure you REACH it! How to recharge your mental, physical and emotional batteries for peak performance “on demand” -- and how to do it 100% naturally! The simple “winner's tool” that helps you stay organized about what you want -- and rewards you with a tremendous feeling of satisfaction and achievement! The Secret “6-Point Attraction Formula” for creating lifelong wealth -- as used by millionaires and high-fliers everywhere! The 100% drug-free way to still the senses and calm your mind -- so you can open up to the life-enhancing cosmic energy around you more easily! The 3-Minute Manifestation Exercise -- simple enough to be done anywhere, but deceptively powerful! All of this - and much, much more - all in a single, compact, THREE Volume course. Plus, of course, the accompanying 27-page workbook - covering all of the essential principles from the full audio course. Could there be a better way of changing your life using the Law of Attraction? Testimonial from our mailbox: "Wow! I highly recommend the Law of Attraction Pro course. I've worked in the self-development industry for the past 10 years. And I've constantly searched for one course that teaches everything, simply. Well, the time has come - and this is it. This course shares everything you need to get started with the Law of Attraction - and seriously boost the results you're getting. Whether you're a beginner or a seasoned pro, do NOT miss this. I'm recommending it to all of my subscribers!"